French Press Racing: "New people, new places"
Thanks for the title Pete. Saturday was one of those days in the woods that reminded me just why it is that I love Vermont so much. 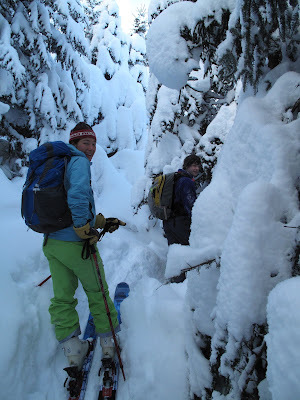 After meeting up with some old friends in the morning, we headed out to meet some new folks to ski a tree stash off a high central Vermont ridgeline. Coffee had us charged up and ready, and after following some nordic ski/snowshoe trails we veered off toward said lines. As is typical of Vermont, getting to the good skiing required some creative skinning through some tight conifer sections. But once we got there the morning snow clouds moved off and the sun came out. I wish I could spend everyday in spots like this. And just like that skins came off, layers, googles, and snacks came out of packs, and we caught a sweet untracked line down through hardwoods. Sure, there was a slight crust below the 6 inches of new snow thanks to last weeks warming event, which made the skiing a little bit trickier than normal. But that didn't keep us from smiling down as we enjoyed some fantastic turns. 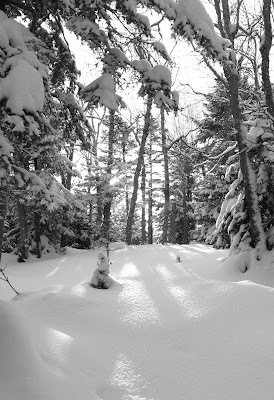 Though another foot or two would be really nice, but the backcountry is starting to come into it's own. Good stuff, and a big thanks to the friends who made it happen.